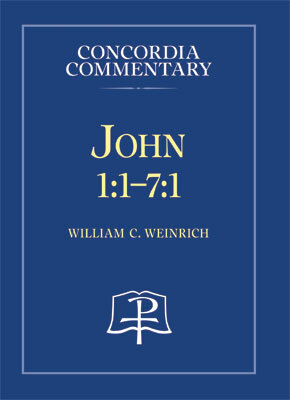 We are anxiously awaiting the arrival of the newest volume in the Concordia Commentary series: John 1:1–7:1 by William Weinrich. In the meantime, we’ve provided an excerpt below to give you a preview of Dr. Weinrich’s discussion on John 3:3. The reign of God is revealed and comes in the crucified Jesus, the Lamb of God, who in the perfect humility of his passion demonstrates himself to be the true Son of God (Jn 19:7; 20:31). The realities of Jesus as Son, his passion and death, and the kingdom of God belong together. Similarly, the believer as a child of God, participation in Christ’s death through Baptism, and seeing the kingdom of God belong together. To participate in the death of Christ is to be “begotten from above” (Jn 3:3), and in the removal of sin one sees the merciful rule of God. The term “the kingdom of God” in Jn 3:3 and Jn 3:5 looks retrospectively to the confession of the Baptist that Jesus is the Lamb of God (Jn 1:29, 36) and the Son of God (Jn 1:34) and prospectively to Jesus’ words about the necessity of the exaltation of the Son of Man (Jn 3:14). Similarly, “to see” the kingdom of God (Jn 3:3) prepares for the reference to the Light that comes into the world (Jn 3:19–21), which refers primarily to the death of Jesus. The new life of the Spirit assumes the shape of the cross of Jesus. The disciple of Jesus, the child of God, lives the life free from sin (Jn 1:29; 8:32–36; 1 Jn 3:5–6) and according to the love of God. It is, therefore, correct to say that to see the kingdom of God is to believe that Jesus is the Christ, the Son of God (Jn 20:31), and that the form of such faith is Christ the Crucified. 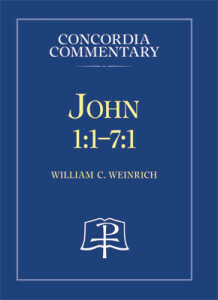 From Concordia Commentary: John 1:1–7:1, pages 384, 387 © 2015 Concordia Publishing House. All rights reserved. 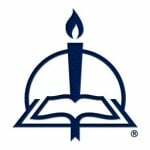 To order John 1:1–7:1, please contact CPH at 800-325-3040 or visit www.cph.org. Click here to learn more about the Concordia Commentary Series. At CPH since 2009, Sarah Steiner was a production editor for the professional and academic book team. She worked on many academic titles, including coordinating the peer review books, and also helped out with Bible resource projects.